What if you're driving a new 415-horsepower, rear-wheel drive muscle car in Springfield with every convenience and infotainment option you've ever seen on a premium luxury sedan; and you can also use it to pick up your mother-in-law from Lambert without listening to a lecture on how grown-ups don't drive muscle cars? Then you might be the proud owner of a 2015 Chevrolet SS in Springfield! The SS is the perfect car for your alter-ego. It looks innocent enough as you pass by the Greene County Courthouse, where officers sit in their vehicles or mill about, taking no notice of you. But once out on some winding county roads, you can enjoy a truly enthralling driving experience. 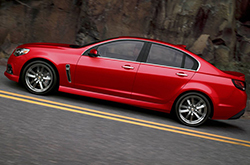 Kelly Blue book's recent Chevy SS review rates it as a "thrilling but manageable car to drive fast." But don't tell your mother-in-law! The new changes for 2015 include the addition of standard Magnetic Ride Control and Brembo rear brakes. (Brembo front brakes were already standard equipment.) Chevrolet listened to consumer demand and added a six-speed manual transmission option for performance driving purists. Even before the manual option was available, Brian Sweeney, U.S. vice president, Chevrolet, let it slip that BMW has been the top non-GM-brand trade-in from new SS buyers. Well, ok, he shouted it from the rooftops, but who can blame him? This year's enhancements have made the already exciting SS even better. Powered by an SAE-certified 415-horsepower V8 delivering 415 pound-feet of torque, the SS with the standard automatic transmission achieves 60 mph from a stand-still in about five seconds. Sport-tuned suspension, low center of gravity and nearly perfect 50-50 weight distribution all combine to deliver superb handling. 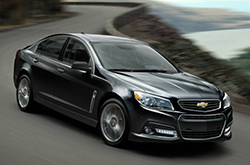 Check out the video overview of features at the end of our 2015 Chevrolet SS review. Standard features are too numerous to mention! It's much easier to note that the new manual transmission is an option, along with a sunroof. The rest is all standard equipment, from a head-up display, remote start and park assist, to your own Wi-Fi hotspot, Bose audio system with navigation, MyLink and hands-free smartphone integration. You name it; the SS has it! 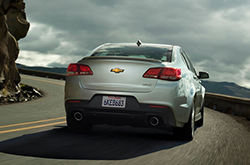 Contact Reliable Chevrolet about leasing or financing a new 2015 Chevy SS in Springfield. We're positive that the SS is perfectly fitted for you. That's why we would like you to compare Chevrolet's latest model against the 2015 Nissan GT-R, Ford Mustang and the Dodge Challenger. Shoppers will love the SS's pronounced exterior styling, as well as its convenient cabin amenities. It's a truly outstanding value, which you'll clearly see when comparing its price to the aforementioned vehicles. Find even more information; see our quick-facts list for the SS - bullets below. We've taken the time to create reviews about vehicles like the 2015 Chevrolet SS because we know how important it is to your car search. It's a hassle to find hard facts about a large array of cars in one spot. That's why it's OUR responsibility to offer reviews from veteran auto critics, so you have access to these tools on one site. Make informed decisions when it comes to your next auto purchase - don't take guesses! Each section is packed with facts and vehicle features in a page layout that's easy to understand. Is the SS not the right choice for you? Find out more about other vehicles offered by Reliable Chevrolet using our reviews index page. With it you can review and compare Chevrolet's entire collection of vehicles.